The field of candidates vying to become a delegate in District 19, with Ben Kramer leaving, is growing. This month, Derwood attorney Vaughn Stewart filed with the state’s Board of Elections to run for delegate in the district, which includes portions of Silver Spring and Rockville. On Monday, Marlin Jenkins, a Silver Spring labor attorney and major in the Maryland National Guard, announced he would run, too. Six Democrats, including two incumbents and Stewart, have filed to run for three delegate seats in next year’s elections. No Republicans have filed. Kramer is running for state Senate in the district after the incumbent senator, Roger Manno, announced he would pursue the District 6 congressional seat. Incumbent Dels. Bonnie Cullison and Marice Morales both are seeking seek re-election. Stewart, 28, is an attorney at the Washington, D.C., law firm WilmerHale and represents refugees pro bono, according to his campaign website bio. In a press release last week, he said he would work to improve the state’s health care system, lower prescription drug prices and ease traffic congestion in the area as a delegate. “Quality health care, affordable prescription drugs, and paid sick leave should be rights of every single Marylander,” Stewart said in a statement. This year, he was diagnosed as having non-Hodgkin lymphoma, but it is in remission, his campaign website says. He has previously said his two battles with cancer in the last 10 years have given him insight into health care policy and the need to improve options for patients. Stewart worked as a policy director for Rep. Jamie Raskin’s congressional campaign and served on the boards of the Action Committee for Transit and the Montgomery County Renters Alliance. His campaign bio says he served on a Domestic Policy Council under the Obama administration. He grew up in Anniston, Alabama, where his father served as both a judge and a mayor, according to his website. Stewart received his undergraduate degree from the University of Pennsylvania and law degree from New York University. He is the treasurer of the District 19 Democratic Club. In a phone interview Monday, Jenkins, 35, likened his personal story to that of Montgomery County Executive Ike Leggett. He said he grew up poor in Vidalia, Louisiana, a town of about 3,000 people. His high school graduating class had 70 students. He attended Southern University and A&M College in Baton Rouge while serving in the Louisiana National Guard. As a soldier, he was deployed to help Hurricane Katrina victims and on humanitarian missions building infrastructure in Guatemala, Honduras and Belize. He said he earned a Bronze Star Medal in Iraq. After returning from Iraq, he graduated from law school at North Carolina Central University in 2012. He moved to Silver Spring to work at the National Institutes of Health in Bethesda and landed his current job as a labor attorney for the American Federation of Government Employees. During the 2017 General Assembly session, he volunteered in Manno’s office, assisting with labor and veteran-related legislation. Jenkins said he has attended cookouts at Leggett’s home, but the county executive has not encouraged him to run or endorsed him. Leggett and Jenkins grew up in towns about 30 minutes apart in Louisiana—during different time periods, as Leggett is 73—and attended the same undergraduate university, Jenkins noted. Leggett also served in the military, as an Army captain during the Vietnam War. Jenkins said he is running to provide other people with opportunities he received. He noted that as a Louisiana National Guard member, he received free college tuition—a policy he’d like to bring to Maryland, which offers a waiver up to 50 percent for college students serving in the National Guard. He said he was enrolled in Head Start as a child, which prepared him for school and helped his mother raise three boys on her own. Jenkins is a member of the Montgomery County Democratic Central Committee. 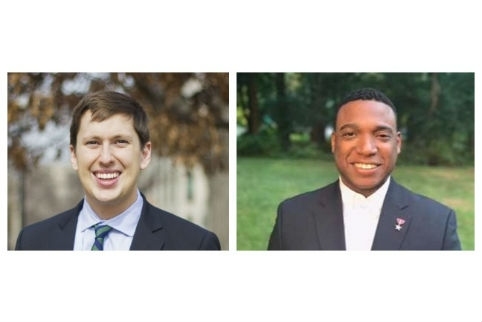 Other Democrats who have filed to run in the district include software developer Brian Crider, of Rockville; former health care operations manager Jade Wiles Jr., of Silver Spring; and education policy consultant Justin Dayhoff, of Derwood.